The joy of discovery is one of the little pleasantries of the reviewing life that keeps me at it. Case in point, my recent introduction to the music of beat.dowsing, aka Carl Martin. 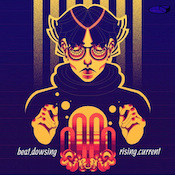 His new release, rising.current, is a blend of downtempo attitude and triphop grooves with a little jazz influence thrown in for good measure. Straight out of the gates, “Renegades” lays down a classic jazz backbeat and Rhodes-like keyboard chords and proceeds to just get groovier from there. While rising.current doesn’t simply stay this course, and sometimes wanders into slightly less solid territory, it does maintain a very fun and funky air throughout. “It’s Up to You” jumps out on a bass keyboard riff that oozes classic R&B cred. Triphop vocal drops and some sharp lines on the conga keep it very, very cool. Please set the volume to full for this one. And speaking of bass, when “Undeniable Sequence” slicks its way in with an oh-so-cool low end and snazzy cymbal taps, if you don’t think you’re about to watch a ’70s cop show…well, then you’re probably not as old me. This track has a clean, small-combo feel to it. It’s tight as hell and a lot of fun to listen to. “Heatwave” absolutely struts its way through its four minutes on stage, underscored with soft pads that reveal themselves nicely at the end. The mis-steps here are few and negligible; “Non.time” starts out slow and smoky, nudged ahead by a shuffling beat, but then hits a forcible shift in tempo that feels like a bit of an experiment gone awry. It’s like the track is arguing with itself about what it wants to be. The listener’s focus is pulled in non-complementary directions. It just doesn’t work. “Bird.tribe” just gets too cluttered in its own glitchy weight to appeal to me. The majority of rising.current is so silky smooth and enjoyable, those moments quickly get lost in the flow. Martin says he’s been at this for 20 years under various aliases so while I’m late to the beat.dowsing party, I am definitely glad to have finally made his auditory acquaintance. rising.current is one of those releases that I’ll slot into my uptempo playlist and groove on whenever it comes up. Definitely worth checking out.